In light of our most recent military victory in the global War on Terror, we as a nation cannot forget that there is work still to be done. Members of our armed forces are deployed around the world doing exactly what they were doing yesterday: routing out terrorists wherever they may hide. In fact, units across the nation are still mobilizing for yearlong tours in Afghanistan and Iraq. Just last month, on April 15th, 2011, orders were sent to members of the 1st Battalion, 25th Marines, Fort Devens, Massachusetts. This proud US Marine Corps Reserve unit, known as “New England’s Own,” has already mustered and shipped out for training. Our nation’s best and brightest are among these hometown heroes; fire fighters, police officers, doctors, lawyers, and even a banker or two are listed among our troops. These men and women from all walks of life truly exemplify the citizen-soldier ethos. In the wake of this latest call-to-arms, the Armed Forces Alumni Association at Harvard Business School (HBS) presented a Blue Star Banner in honor of Daniel Gwak, a current HBS Student in the Class of 2012 who reported for duty at Fort Devens on Thursday, April 28th. His orders are scheduled to end in June, 2012. The history surrounding the Blue Star Service Flag extends back to the First World War. Since World War II, the Service Flag has been the official banner authorized by the Department of Defense for display by families or organizations that have members serving in the Armed Forces during any period of war. The Harvard Business School community is proud to fly the Service Flag for Lance Corporal Daniel Gwak. After immigrating to the United States from Korea, Mr. Gwak become a naturalized citizen and graduated from Cornell University in 2005. He then spent two years in Mergers & Acquisitions at Credit Suisse and continued to hone his financial skills at the Carlyle Group. While his Wall Street career blossomed, a desire to do more and to be a part of something larger than himself, even larger than Wall Street, grew inside Gwak. Like thousands of immigrants before him, Gwak wanted to serve the country that provided so much. In 2008, Gwak joined the world’s strongest brotherhood. He enlisted in the US Marine Corps Reserves, completed basic training, and returned to civilian life. Shortly after, he was accepted into the full time MBA program at Harvard Business School and began classes last September as a member of the Class of 2012. And today, one year shy of his graduation date, Lance Corporal Gwak has been called to action. Throughout the school’s long history, students have periodically received similar orders, highlighting the close relationship between HBS and the U.S. Military which began during the First World War and is steeped in mutual respect. By World War II, HBS became a virtual service academy as it prepared entire classes to support the war effort. Today, veterans, reservists and active duty personnel make up approximately 5% of each class. Being a true citizen-soldier, Lance Corporal Gwak is an important reminder that the strength of our military stems not from high tech weapons and computers, but rather from the hearts and minds of those brave souls who wear the uniform. Aswe enjoy Memorial Day, let us all take a moment to thank those who serve or have served in the military and commemorate those who sacrificed everything so we can enjoy the freedoms unique to this great nation. The Committee believes in the conjunction of interests between the support of democratic movements around the world and the long-term interests of the United States. In the past, support of dictatorships has led to the erosion of America’s prestige and leadership in Asia (by the support of the Thieu regime in South Vietnam), in Africa (by relations with South Africa), in Latin America (by the intervention in the Dominican Republic), and in Europe (by the support of the Greek junta). By a radically distinct commitment to democratic governments and democratic movements, the United States can assume the leadership of the struggle against totalitarianism and the suppression of human rights. The support of democratic movements is intimately linked to the Committee’s advocacy of the right to national and cultural self-determination for all peoples – with due respect for the rights of national minorities. The Committee focused on applying these principles to the Middle East conflict. Thirty-six years later, in the “Arab Spring” of 2011, we’ve seen the first wide-scale application of democratic realism to the Middle East, a region long-dismissed as not yearning for democracy. The full manifesto of the Committee is reproduced here. The handwritten comments in the margin give a sense of the prevailing views of the time. The comments were written by Gerald Segal, then a graduate student in International Relations at the London School of Economics, and later one of the leading experts in the United Kingdom on International Relations. Although Gerald Segal’s comments reflected the prevailing views, he didn’t dismiss the Committee’s ideas, but instead challenged it to resolve some of the difficult issues. The manifesto was largely written by Martin Kernberg ‘76. He and committee chairman Michael Segal ’76 both spent their teenage years as Americans outside of the USA, growing up with a sense of how Americans are seen by others, a theme now familiar from the presidency of Barack Obama JD’91. Faculty advisors included Harvard Prof. Daniel Patrick Moynihan, who despite jumping from UN Ambassador in 1975 to US Senator in 1976, was a major inspiration to the group. Zionism is the historic struggle of the Jewish people for national self-determination and national liberation in the face of two thousand years of pogroms, genocide, and wars of annihilation. All national liberation movements ask for self-determination for their people in their homeland. By singling out for condemnation the national liberation movement of Jewish people, this resolution represents a virulent form of racism and anti-Semitism. Israeli officials, wary of the implicit message that Palestinian Arabs would also have a right to self-determination, sent diplomats to try to convince the Committee to abandon the petition, an overture the Committee rejected. The ad was paid for by members of the Committee with the hope that alumni would eventually cover the cost, as occurred months later. The Committee’s role was one of being visionary in sketching the future of the US role in the world, rather than a powerful force to bring it about. But much is learned when undergraduates run an organization dedicated to grappling with important problems. Rashid Khalidy of the P.L.O. says: “If the Israelis had any brains they could neutralize Palestinian irredentism just by giving back the West Bank.” Well, if the Palestinians had any brains they could neutralize Israeli opposition to the P.L.O. by adhering to principles of democracy and peaceful coexistence. Perhaps a deal can be worked out. Looking back on the activities of the Committee provides concrete examples of why student groups matter, both in learning how to grapple with important issues and in having the experiences that make it second-nature to encourage the next generation to do the same. Looking back 36 years also gives a sense of just how long it can take for change to be achieved. Columbia ROTC was once a special institutional partnership that educated generations of Columbia students in the civil-military leadership tradition of alumnus and founding father Alexander Hamilton. The partnership was severed when ROTC was effectively barred from Columbia University in 1969. Since 2002, students, alumni, and faculty have organized to restore ROTC on the Columbia campus. The majority of responses to ROTC in the Columbia community have been positive, but Columbia’s acceptance of ROTC has been delayed by opposition to the “don’t ask don’t tell” law (DADT). On December 18, 2010, Congress repealed DADT. On the same day, Columbia President Lee Bollinger declared that the end of DADT is “the opportunity for a new era in the relationship between universities and our military services.” On December 20th, the Student Affairs Committee of the Columbia University Senate, the governing body that must decide whether the university will elect to restore ROTC, announced the formation of the “Task Force on Military Engagement.” The University Senate, which last considered ROTC in 2005, will take up the ROTC issue in the Spring 2011 session. The repeal of DADT makes all the difference in Columbia welcoming ROTC. Much like the November 2010 Yale student survey on ROTC, a majority of Columbians have expressed support for ROTC on campus but not if having ROTC meant importing DADT. 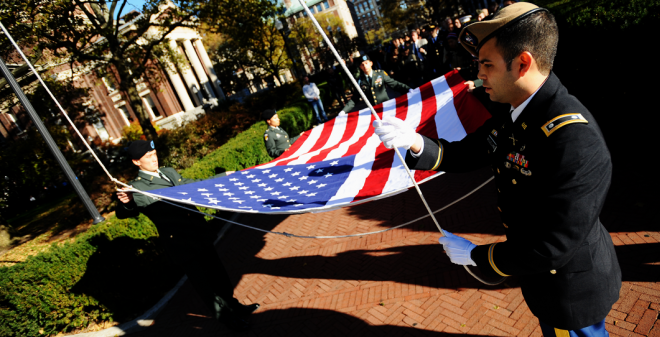 The repeal of DADT means a majority of Columbians now favor having ROTC on campus, period. Military officials currently judge ROTC programs using an accounting standard, i.e., whether an acceptable number of second lieutenants are produced at an acceptable cost, with some consideration for factors such as the host school’s comity with the military, racial diversity, and regional coverage. The effect of current ROTC metrics has been to view the suppressed cadet numbers, long estrangement, and other suspected challenges at Columbia as drawbacks, whereas Columbia’s preeminent institutional strengths have not been judged as countervailing advantages. Since the repeal of DADT, skeptics have challenged the practicality of an ROTC program at Columbia from the military’s perspective. However, the issue is not whether the military is able to add an ROTC program at Columbia; since the Columbia ROTC movement was organized in 2002, ROTC programs have been granted to other host schools. The issue is whether university and military officials will determine that a new Columbia ROTC partnership is feasible and worth the cost. If the evaluation of Columbia as an ROTC host school is limited to the military’s current accounting standard, then Columbia will continue to be doubted as a candidate to host ROTC. Realizing ROTC at Columbia depends on university, government, and military leaders who can see beyond current ROTC metrics and envision the benefits of an institutional partnership that invests Columbia’s strengths in the military and vice-versa. Leaders in all fields often stress that a vision is important, but 90% of the effort is in implementation. Simply adding ROTC to Columbia would fill an important gap at Columbia, but our goal goes beyond simply adding an ROTC program. We envision Columbia ROTC as the leading, state-of-the-art ROTC program in the nation. Much depends on the degree to which the university, the military, and the alumni are willing to implement an ROTC+ vision at Columbia. The military’s evolving 21st Century mission aligns the military with Columbia’s global outlook and raises the potential of a Columbia ROTC+ with course offerings that are a plus both to the university and the military. In an increasingly complex global security environment, America needs military leaders able to adapt on a full spectrum, which means officers who are “lifelong learners” and “creative and critical thinkers” with the best possible academic foundation. Columbia University’s gifted students and combination of top-tier academic and New York City resources offer ROTC an ideal setting for innovative programs to attract qualified young men and women, recruit personnel with specialized skills, and prepare officers for a full range of complex missions with enhanced pre-accession training. Columbia already hosts innovative crosscutting programs that rely upon the special reach and multi-dimensional resources of a flagship university in a world city – Columbia ROTC+ would be a rare opportunity to rise to the needs of the nation with an evolutionary officer program that draws upon everything Columbia University in New York City has to offer. Columbia ROTC+ would take advantage of Columbia’s large diverse pool of top-quality undergraduate and graduate students, a world-class research and learning environment that already trains students in a wide range of scholarly and professional fields, and the unique resources of a world capital. Columbia has top language, anthropology, and civil engineering programs that should immediately interest the Army and Marines, as well as excellent engineering and science programs that should attract the Air Force and Navy. ROTC at Columbia would help solve the military’s absence of ROTC within Manhattan — which has poor access to ROTC despite having the highest concentration of college students in the country — and affirm to Columbia students their nation-building responsibilities in both military and civilian life. The return of ROTC to Columbia University, the flagship academic institution in New York City, would have a positive wider cultural and public relations impact on the military and the university. Any new ROTC program at Columbia would join a distinguished military heritage and find a fraternal community ready to support the program. Columbia’s military tradition dates back to the students who joined the fight for a new American nation. Indeed, the standard bearer for Columbia officership is founding father Alexander Hamilton and his lifetime of visionary leadership in and out of uniform. The Hamilton Society, the student group for ROTC students and Marine officer candidates founded in 2002, has consciously sought to revive General Hamilton’s Columbia military lineage. Columbia enjoys an active and growing population of over 300 student-veterans, the largest by far in the Ivy League, as well as numerous active-duty officers in the graduate programs. Alumni group Columbia Alliance for ROTC has the express purpose of promoting and supporting ROTC at Columbia. Alumni have served in all the military branches, though none more than the Navy, where Columbia Naval officers once rivaled Annapolis’s output. Beyond Columbia’s military community, ROTC would find a supportive environment on campus. Since 2005, University leaders have consistently cited DADT as the only significant obstacle to the university welcoming ROTC, and DADT is no longer relevant. The ROTC movement has grown within Columbia from students, alumni, and professors supporting the military on campus. The steady trend on campus has been to support the military, as expressed by University leaders such as Trustees chairman and Army veteran Bill Campbell and Columbia College Student Council president and ROTC advocate Learned Foote, multiple Columbia Spectator staff editorials calling for ROTC at Columbia, Columbia’s outreach to recent veterans with robust participation in the Yellow Ribbon program, the unveiling of the Columbia War Memorial, and highly visible commissioning ceremonies on campus. In 2006, Columbia even amended the university non-discrimination policy to add “military status” as a protected category. Skeptics point to the current low number of ROTC students at Columbia in order to claim that student interest is too low to sustain an ROTC program on campus. However, their contention is impossible to prove or disprove without an ROTC program on campus. The damaged status of ROTC at Columbia after 1969, alienation from poor exposure, distance and poor access in urban terms, and lack of institutional assistance likely deter most Columbia students from seriously considering ROTC. It’s simply unfair to judge Columbia students for not joining an ROTC program that isn’t there. We first have to plant the seed in order to grow the tree – building up ROTC student numbers at Columbia first requires ROTC on campus. Then, as Columbia ROTC is nurtured into a fully integrated and supported part of the university, Columbia ROTC student numbers will grow over time. That’s just common sense. Roughly one-fourth of the undergraduate population is renewed every year. After ROTC is established on campus and properly advertised, eventually every student applying to Columbia will know about the ROTC program on campus. To attract more youth to military careers and recruit from the nation‘s top colleges, the services should offer full scholarships on a competitive basis, usable anywhere a student chooses to attend, in exchange for enlisted service in the reserves (and summer officer training) during schooling, and 5 years of service after graduation, to include officer training school. It is worth noting that, of the three ROTC programs, Navy ROTC is viewed by many as the ROTC program most likely to succeed at Columbia. The undergraduate NROTC survey of 2008 originated from SEAS students requesting the pathway to Naval officership, and in spite of the unpopularity of DADT, SEAS students voted in favor of Navy ROTC at Columbia. Unfortunately, despite the demonstrated student interest, Columbia students have zero access to NROTC. The absence of NROTC at Columbia is made doubly tragic by the storied history of Naval officer training at Columbia. Many alumni supporters are Navy veterans who would be particularly supportive of a Navy ROTC on campus. ROTC campus space needs are relatively modest and could reasonably be met at Columbia under current conditions. ROTC-friendly neighboring spaces such as Grant’s Tomb and Central Park would augment the space available for ROTC. Furthermore, the projected timeline of the Manhattanville university expansion coincides with the likely timeline for starting an ROTC program at Columbia, which should increase the space available for ROTC on the main campus. The faculty appointment issue has been solved well at universities comparable to Columbia. At MIT, for example, ROTC leaders are designated as “visiting professors.” At Princeton, ROTC professors are assigned “a rank equivalent to the senior academic rank of professor.” Both these formulations satisfy the law without undermining the status of regular tenured professors and accord with Columbia’s instructional appointment policy. The courses of instruction issue has also been solved in ways that fit with the values of comparable universities. Although it has been claimed that “the University would also have to grant credit for ROTC coursework” there is no such requirement in the law. Indeed, Princeton has announced that “credit would not be provided at Princeton” for ROTC courses, despite language in the 1972 Army-Princeton agreement that “academic credit for military professional subjects will be judged by the institution under the same procedure and criteria as for other institutional courses.” Similar conditions for ROTC courses may be observed at MIT. Regular faculty arranging ROTC credit: Professors at comparable universities such as Harvard have taught courses that were coordinated with the military and received ROTC as well as university credit. This model can be expanded, especially as the subject areas relevant to military leadership continue to expand. Although universities may have significant gaps in areas of interest to the military, departments are glad for opportunities to hire top scholars to cover important areas. Under these models, some courses could be offered with joint Columbia and ROTC credit. Creating an ROTC+ model in which ROTC students get courses such as military history, international relations, game theory, and anthropology provides to the military a “laboratory of the universities,” and also enhances the course offerings of the university. ROTC+ offers capabilities that are a plus both to the university and the military. President Bollinger’s encouraging statement immediately following the repeal of DADT was the necessary first step towards restoring the Columbia ROTC partnership. The next step is for the University Senate to deliberate, then approve ROTC. Input from the Columbia community will be vital to the University Senate’s decision. If the University Senate approves ROTC, university officials would then reach out to the military to start negotiating an ROTC program at Columbia. In order for the military and Columbia to negotiate constructively, it is important that the two sides deal with each other in good faith, are motivated by compelling interests and tangible benefits, and judge Columbia ROTC by a standard that favors Columbia’s institutional strengths. The intervention of political leaders to break through bureaucratic deadlocks may be necessary. Alumni will also be crucial. Columbia alumni have a strong voice in both the university and in government. Alumni are crucial in encouraging students to apply to Columbia and encouraging them to try ROTC. Alumni are also crucial in transcending bean-counter arguments and providing resources to achieve important goals. Few causes are as manifestly impactful as advocating for Columbia ROTC. As it is today, much of the weight of future missions will be borne by young officers. They must be able to lead their soldiers in any combination of homeland defense, disaster relief, crisis stabilization, ministerial training, conflict prevention, security and stability, counterinsurgency, counterterrorism, essential government services, emergency infrastructure, and humanitarian aid. In the short term, young lieutenants and captains prepared by Columbia ROTC will be better equipped to rapidly innovate and adapt to unpredictable challenges. Over their careers, a strong academic foundation will help Columbia officers to master their duties with a commensurately greater acquisition of faculties. Pentagon budget cuts that may lead to leaner capabilities on the ground and the forecast of politically sensitive missions that rely on smaller numbers of forces further point to a heightened need for the exceptional individual officers that Columbia can provide the nation. The challenges facing America are great, but so are the opportunities. At this crossroads in our history, Columbia must choose: are we an “Ivory Tower” disconnected from the needs of People and nation, and only good for insular thinking and selfish pursuits? Or, are we truly America’s producer of vanguard leaders who pursue the greater good and the improvement of all parts of our society, including the military? Let us stand with a greater determination. And let us move on in these powerful days, these days of challenge, to make America what it ought to be. We have an opportunity to make America a better nation. As Columbians and Americans, it is again time for us to stand with a greater determination, for the sake of People and nation. The decision we make for ROTC at Columbia is about more than just ROTC. We are shaping our generation’s vision of Columbia University and of ourselves as fellow citizens. Since 2006, 20 to 40 percent of the bee colonies in the United States alone have suffered “colony collapse.” Suspected culprits ranged from pesticides to genetically modified food. Now, a unique partnership — of military scientists and entomologists — appears to have achieved a major breakthrough: identifying a new suspect, or two. The U.S. Army’s Edgewood Chemical Biological Center at Aberdeen Proving Ground houses a collection of scientists dedicated to defeating chemical and biological threats on the battlefield. Much of their research is focused on mechanisms and techniques for the detection of dangerous viral and microbial agents in the environment, such as those that might be used as biological weapons. In this case, the Army scientists were seeking to test a new method in which mass spectrometry is used to detect the proteins present in a biological sample and then make use of software and a large annotated database they had developed to evaluate the sources of those proteins to determine what organisms might be present. It just so happened that entomologists at the University of Montana were looking for just such a capability. 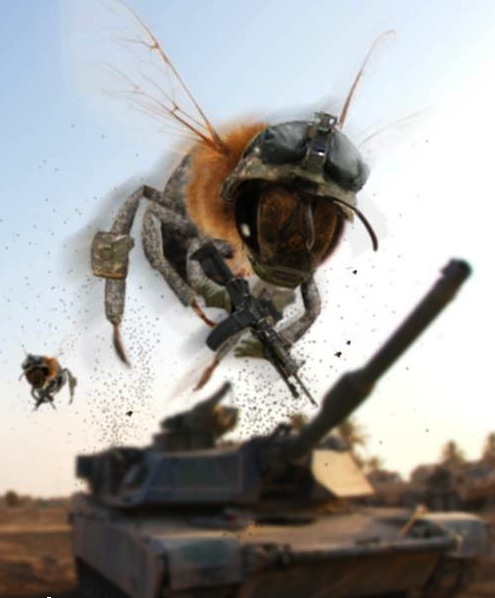 With this system, the Army scientists were able to identify proteins from two microorganisms, Iridovirus and Microsporidian, in every population of dead honeybees. Based upon their evidence it is the intersection of this virus and fungus, found in the gut of the honeybee, that is suspected to be the cause of their demise. 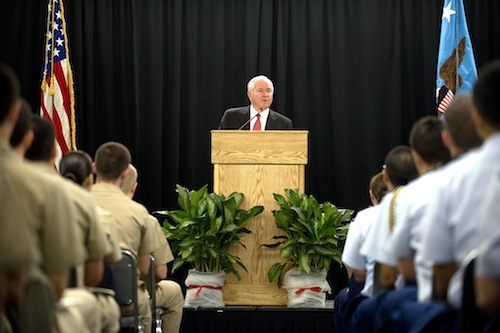 In a lecture at Duke University, Secretary of Defense Robert Gates remarked upon the ever present divide that exists between the nation and those who serve in uniform, noting that only “a tiny sliver of America” continues to volunteer for military service, and that many parts of the country are woefully underrepresented, particularly urban areas like Chicago and Los Angeles. He hones in on the disparities that exist with respect to resourcing for Officer recruitment, noting that “the state of Alabama, with a population less than 5 million, has 10 Army ROTC host programs. The Los Angeles metro area, population over 12 million, has four host ROTC programs. The Chicago metro area, population 9 million, has 3.” The disparity is equally as great in places like New York City which, with a population of 8 million, hosts only 4 ROTC programs, one of which is open and accessible to only 5% of the total college student population. Thank you for the invitation and that warm welcome. It’s a relief to be back on a university campus and not have to worry about football. The first fall I was President of Texas A&M, I had to fire a longtime football coach. I told the media at the time that I had overthrown the governments of medium-sized countries with less controversy. I’d be remiss in not pointing out one major connection between Duke and the military – that Mike Krzyzewski attended, played for, and later coached at West Point. Earlier this year the Duke Basketball team came to Washington, D.C., to receive President Obama’s congratulations for the NCAA championship. Coach K also brought them by the Pentagon to see the 9/11 memorial and meet with some of the men and women who serve in our military. I think I can speak for everyone they saw in saying that the visit was much appreciated. For the undergraduates here, I know you’re well-accustomed to the challenge of staying awake through long lectures. I promise I won’t test your endurance too much today. I’m reminded of the time when George Bernard Shaw told a famous orator he had 15 minutes to speak. The orator protested, “How can I possibly tell them all I know in 15 minutes?” Shaw replied, “I advise you to speak slowly”. As a former university president, visiting a college campus carries a special meaning for me. It was not that long ago that my days and duties were made up of things like fundraising, admissions policies, student and faculty parking, dealing with the state legislature, alumni, deans, and the faculty. In that last case, as a number of college presidents have learned the hard way, when it comes to dealing with faculty – the tenured faculty in particular – it’s either be nice or be gone. Some of my warmest memories of Texas A&M are of walking around the 48,000 student campus and talking to students – most of them between 18 and 24 years of age – seeing them out on their bikes, or even occasionally studying or going to class. For nearly four years now, I have been in a job that also makes me responsible for the well-being of a larger number – in this case, a very much larger number – of young people in the same 18- to 24-year old age group. But instead of wearing J-Crew they wear body armor. Instead of carrying book bags they are carrying assault rifles. And a number of them – far too many of them – will not come home to their parents. These young men and women – all of whom joined knowing what would be asked of them – represent the tip of the spear of a military that has been at war for nearly a decade – the longest sustained combat in American history. The Iraq and Afghanistan campaigns represent the first protracted, large-scale conflicts since our Revolutionary War fought entirely by volunteers. Indeed, no major war in our history has been fought with a smaller percentage of this country’s citizens in uniform full-time – roughly 2.4 million active and reserve service members out of a country of over 300 million, less than one percent. This tiny sliver of America has achieved extraordinary things under the most trying circumstances. It is the most professional, the best educated, the most capable force this country has ever sent into battle. Yet even as we appreciate, and sometimes marvel at, the performance of this all-volunteer force, I think it important at this time – before this audience – to recognize that this success has also come at significant cost. Above all, the human cost, for the troops and their families. But cultural, social, and financial costs as well in terms of the relationship between those in uniform and the wider society they have sworn to protect. So for the next few minutes, I’d like to discuss the state of America’s all-volunteer force, reflecting on its achievements while at the same time considering the dilemmas and consequences that go with having so few fighting our wars for so long. These are issues that must be acknowledged, and in some cases dealt with, if we are to sustain the kind of military America needs in this complex and, I believe, even more dangerous and unstable new century. First, some brief historical context. From America’s founding until the end of World War II, this country maintained small standing armies that would be filled out with mass conscription in the case of war. Consider that in the late 1930s, even as World War II loomed, the U.S. Army ranked 17th in the world in size, right below Romania. That came to an end with the Cold War, when America retained a large, permanent military by continuing to rely on the draft even in peacetime. Back then, apart from heroism on the battlefield, the act of simply being in the military was nothing extraordinary or remarkable. It was not considered a sign of uncommon patriotism or character. It was just something a healthy young man was expected to do if called on, just as his father and grandfather had likely done in the two world wars. Among those who ended up in the military in those early years of the Cold War were people like Elvis Presley and Willie Mays, movie stars, future congressmen, business executives. The possibility of being drafted encouraged many to sign up so they could have more control over their fate. As I can speak from experience, the reality of military service – and whether to embrace, avoid, or delay it – was something most American men at some point had to confront. The ethos of service reinforced by the strong arm of compulsion extended to elite settings as well. A prominent military historian once noted that of roughly 750 of his classmates in the Princeton University class of 1956, more than 400 went on to some form of military service – a group that included a future Harvard President, governor of Delaware, and Pulitzer Prize winning reporter for the New York Times. That same year, more than 1,000 cadets were trained by Stanford University’s ROTC program. The controversy associated with the Vietnam War and the bitterness over who avoided the draft and who did not, led to a number of major changes in our military and American society. One of them was the end of conscription and the beginning of the All Volunteer Force under President Nixon. Over the past four decades, after a difficult transition period during the 1970s, the all-volunteer experiment has proven to be a remarkable success. The doubts – and there were many inside and outside the military– were largely overcome. Indeed, the United States would not be able to sustain complex, protracted missions like Iraq and Afghanistan at such a high standard of military performance without the dedication of seasoned professionals who chose to serve – and keep on serving. Whatever the shortcomings there have been in Iraq and Afghanistan stemmed from failures and miscalculations at the top, not those doing the fighting and leading on the ground. It has taken every ounce of our troops’ skill, initiative and commitment to battle a cunning and adaptive enemy at the front while overcoming bureaucratic lassitude and sometimes worse at the rear. A key factor in this success is experience. Consider that, according to one study, in 1969 less than 20 percent of enlisted Army soldiers had more than four years of service. Today, it is more than 50 percent. Going back to compulsory service, in addition to being politically impossible, is highly impractical given the kinds of technical skills, experience, and attributes needed to be successful on the battlefield in the 21st century. For that reason, reinstituting the draft is overwhelmingly opposed by the military’s leadership. Nonetheless, we should not ignore the broader, long-term consequences of waging these protracted military campaigns employing – and re-employing – such a small portion of our society in the effort. First, as a result of the multiple deployments and hardships associated with Afghanistan and Iraq, large swaths of the military – especially our ground combat forces and their families– are under extraordinary stress. The all volunteer force conceived in the 1970s was designed to train, prepare, and deploy for a major – and quick – conventional conflict – either against the Soviet Union on the plains of Central Europe or a contingency such as the first gulf war against Iraq in 1991. In that instance – and I remember it well as I was Deputy National Security Advisor at the time – more than half a million U.S. troops were deployed, fought, and mostly returned home within one year. By contrast, the recent post-9/11 campaigns have required prolonged, persistent combat and support from across the military. Since the invasion of Iraq, more than 1 million soldiers and Marines have been deployed into the fight. The Navy has put nearly 100,000 sailors on the ground while maintaining its sea commitments around the globe. And the Air Force, by one count, has been at war since 1991, when it first began enforcing the no-fly zone over Iraq. U.S. troops and their families have held up remarkably well given the demands and pressures placed on them. With the exception of the Army during the worst stretch of the Iraq war, when it fell short of recruiting targets and some measures of quality declined, all the services have consistently met their active recruiting and retention goals. In some cases the highest propensity to re-enlist is found in units that are in the fight. When I visited Camp Lejeune last year – a Marine Corps base about 150 miles from Durham – an officer told me about one unit whose assignment was switched from Japan to Afghanistan. As a result, about 100 Marines who were planning to get out of the military decided to sign up again so they could deploy with their buddies. The camaraderie and commitment is real. But so is the strain. On troops, and especially on their families. I know – I hear it directly during my trips to Army and Marine bases across this country, where spouses and children have had their resilience tested by the long and frequent absences of a father, mother, husband or wife. There are a number of consequences that stem from the pressure repeated deployments – especially when a service member returns home sometimes permanently changed by their experience. These consequences include more anxiety and disruption inflicted on children, increased domestic strife and a corresponding rising divorce rate, which in the case of Army enlisted has nearly doubled since the wars began. And, most tragically, a growing number of suicides. While we often speak generally of a force under stress, in reality, it is certain parts of the military that have borne the brunt of repeat deployments and exposure to fire – above all, junior and mid-level officers and sergeants in ground combat and support specialties. These young men and women have seen the complex, grueling, maddening face of asymmetric war in the 21st century up close. They’ve lost friends and comrades. Some are struggling psychologically with what they’ve seen, and heard and felt on the battlefield. And yet they keep coming back. This cadre of young regular and non-commissioned officers represents the most battle-tested, innovative and impressive generation of military leaders this country has produced in a long time. These are the people we need to retain and lead the armed forces in the future. But no matter how patriotic, how devoted they are, at some point they will want to have the semblance of a normal life – getting married, starting a family, going to college or grad school, seeing their children grow up – that they have justly earned. Measures such as growing the size of the Army and Marines, increasing what is called “dwell time” at home, drawing down in Iraq, and beginning a gradual transition next year in Afghanistan should reduce this stress over time. Properly funded support programs to help troops and families under duress – the kind championed by our First Lady – can also make a difference. But in reality, the demands on a good part of our military will continue for years to come. And, it begs the question: How long can these brave and broad young shoulders carry the burden that we – as a military, as a government, as a society – continue to place on them? There is also a question – and it is an uncomfortable and politically fraught question – of the growing financial costs associated with an all volunteer force. Just over the past decade – fueled by increasing health costs, pay raises, and wartime recruiting and retention bonuses – the amount the military spends on personnel and benefits has nearly doubled: From roughly $90 billion in 2001 to just over $170 billion this year out of a $534 billion defense budget. The health care component has grown even faster, from $19 billion a decade ago to more than $50 billion this year, a portion of that total going to working-age retirees whose premiums and co-pays have not increased in some 15 years. To be clear, we must spare no expense to compensate or care for those who have served and suffered on the battlefield. That is our sacred obligation. But given the enormous fiscal pressures facing the country, there is no avoiding the challenge this government, indeed this country faces, to come up with an equitable and sustainable system of military pay and benefits that reflects the realities of this century. A system generous enough to recruit and retain the people we need and to do right by those who’ve served – but not one that puts the Department of Defense on the same path as other industrial age organizations that sank under the weight of their personnel costs. The political resistance to confronting these costs is understandable, given the American people’s gratitude towards their countrymen who have chosen to serve. This nation has come a long way from the late 1960s and early 1970s, when too many returning Vietnam veterans were met with sullen indifference or worse – especially in cosmopolitan or academic enclaves. Today, in airports all over the country, troops returning or leaving for Afghanistan or Iraq receive standing ovations from other passengers. Welcome home parades, letters and care-packages, free meals, drinks, and sports tickets – all heartfelt signs of appreciation large and small that bridge the political divide. Veterans of our wars are also welcomed to campuses all across America as they return to school. In broad demographic terms, the Armed Forces continue to be largely representative of the country as a whole – drawing predominantly from America’s working and middle classes. There are disparities when it comes to the racial composition of certain specialties and ranks, especially the most senior officers. But in all, the fears expressed when the all volunteer force was first instituted – that the only people left willing to serve would be the poorest, the worst educated, the least able to get any other job – simply did not come to pass. As I alluded to earlier, that group would be hard pressed to make it into a force that, on average, is the most educated in history. Where virtually all new enlistees have a high school diploma or equivalent – about 15 percent more than their civilian peers – and nearly all officers have bachelors’ degrees, many have Masters, and a surprising number, like General David Petraeus, have PhDs. At the same time, an ever growing portion of America’s 17 to 24 year olds – about75% – is simply ineligible or unavailable to serve for a variety of reasons – above all health and weight requirements in an age of spiraling childhood obesity. Having said that, the nearly four decades of all-volunteer force has reinforced a series of demographic, cultural, and institutional shifts affecting who is most likely to serve and from where. Studies have shown that one of the biggest factors in propensity to join the military is growing up near those who have or are serving. In this country, that propensity to serve is most pronounced in the South and Mountain West, and in rural areas and small towns nationwide – a propensity that well exceeds these communities’ portion of the population as a whole. Concurrently, the percentage of the force from the Northeast, West Coast, and major cities continues to decline. I am also struck by how many young troops I meet grew up in military families, and by the large number of our senior officers whose children are in uniform – including the recent commander of all U.S. Forces in Iraq whose son was seriously wounded early in the war. The military’s own basing and recruiting decisions have reinforced this growing concentration among certain regions and families. With limited resources, the services will focus their recruiting efforts on candidates where they are most likely to have success – with those whose friends, classmates, and parents have already served. In addition, global basing changes in recent years have moved a significant percentage of the Army to posts in just five states: Texas, Washington, Georgia, Kentucky, and here in North Carolina. For otherwise rational environmental and budgetary reasons, many military facilities in the northeast and west coast have been shut down, leaving a void of relationships and understanding of the armed forces in their wake. This trend also affects the recruiting and educating of new officers. The state of Alabama, with a population less than 5 million, has 10 Army ROTC host programs. The Los Angeles metro area, population over 12 million, has four host ROTC programs. The Chicago metro area, population 9 million, has 3. It makes sense to focus on places where space is ample and inexpensive, where candidates are most inclined sign up and pursue a career in uniform. But there is a risk over time of developing a cadre of military leaders that politically, culturally, and geographically have less and less in common with the people they have sworn to defend. I’d like to close by speaking about another narrow sliver of our population, those attending and graduating from our nation’s most selective and academically demanding universities, such as Duke. In short, students like you. Over the past generation many commentators have lamented the absence of ROTC from the Ivy League and other selective universities. Institutions that used to send hundreds of graduates into the armed forces, but now struggle to commission a handful of officers every year. University faculty and administrators banned ROTC from many elite campuses during the Vietnam War and continued to bar the military based on the Don’t Ask Don’t Tell policy – with Duke being a notable and admirable exception with your three host programs. 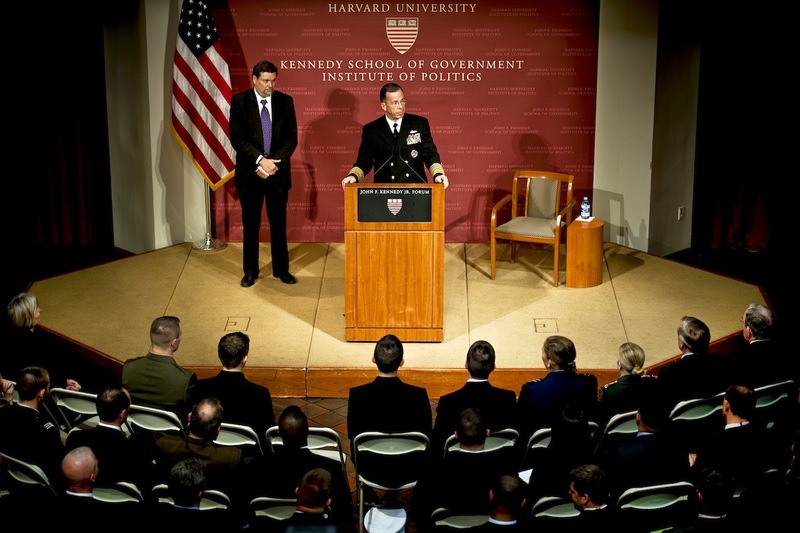 I am encouraged that several other comparable universities – with the urging of some of their most prominent alumni, including the President of the United States – are at least re-considering their position on military recruiting and officer training – a situation that has been neither good for the academy or the country. But a return of ROTC back to some of these campuses will not do much good without the willingness of our nation’s most gifted students to step forward. Men and women such as you. One does not need to look too hard to find Duke exemplars of selflessness and sacrifice. Consider the story of Jonathan Kuniholm, currently a Duke graduate student in biomedical engineering, who lost part of his arm as Marine reservist in Iraq. Now he is putting his experience and expertise to work designing new prosthetics – work that will help other amputees in and out of uniform. There is Eric Greitens, class of 1996, Rhodes Scholar, Navy Seal. After narrowly missing injury himself during a mission in Iraq, he came back home and founded the nonprofit “The Mission Continues” to help wounded troops and veterans continue serving in some capacity. And last year, when it came time to reshape and reform the half-trillion dollar enterprise known as the Department of Defense, the person whose counsel I relied on to make the toughest budget decisions was Lieutenant General Emo Gardner, career Marine Corps aviator, Duke class of 1973. No doubt, when it comes to military service, one can’t hide from the downsides: The frustration of grappling with a huge, and frequently obtuse bureaucracy. Frequent moves to places that aren’t exactly tourist destinations or cultural hubs. Separation from loved ones. The fatigue, loneliness and fear on a distant dusty outpost thousands of miles from home. And then there is the danger and the risk. Next to the sidewalk between your chapel and the divinity school there is an unobtrusive stone wall. For decades the only names on it were your alumni killed in World War II. Last October 54 names were added to the wall for those Duke men and women who died in the wars since then, including two who made the ultimate sacrifice in Iraq. Matthew Lynch, class of 2001, champion swimmer, following in his father’s footsteps as a United States Marine. And, James Regan, class of 2002, son of an investment banker who turned down offers from a financial services firm and a law firm to join the army rangers. But beyond the hardship and heartbreak – and they are real – there is another side to military service. That is the opportunity to be given extraordinary responsibility at a young age – not just for lives of your troops, but for missions and decisions that may change the course of history. In addition to being in the fight, our young military leaders in Iraq and Afghanistan, have to one degree or another found themselves dealing with development, governance, agriculture, and diplomacy. They’ve done all this at an age when many of their peers are reading spreadsheets and making photocopies. And that is why, I should add, they are often in such high demand with future employers and go on to do great things – in scholarship, in government, in business – in every walk of life. So I would encourage you and all young Americans, especially those at the most selective universities who may not have considered the military, to do so. To go outside your comfort zone and take a risk in every sense of the word. To expand what you thought you were capable of doing when it comes to leadership, responsibility, agility, selflessness, and above all, courage. For those for whom military service is neither possible or the right thing for whatever reason, please consider how you can give back to the country that has given us all so much. Think about what you can do to earn your freedom – freedom paid for by those whose names are on that Duke wall and in veterans’ cemeteries across this country and across the world. Will the wise and honest here at Duke come help us do the public business of America? Because, if America’s best and brightest young people will not step forward, who then can we count on to protect and sustain the greatness of this country in the 21st century? In the last three years, Hollywood, along with independent film companies and some documentarians, have begun producing films related to the wars against terror in Iraq and Afghanistan. The fact that the conversation has started is a vast improvement from the early years when all that was available were short news segments from embedded reporters and insurgency propaganda. In the following selection of films, the viewpoints range from the soldier’s view and the families they left behind to the political woes of elected officials trying to manage the conflicts and the public opinions back home. Are they getting the story right? You decide. As delighted as I am for Kathryn Bigelow to be the first female to win best director, it is a shame that with so few movies about Iraq, (and still so many misconceptions among the American people) the one that caught so many people’s attention, got so much wrong. The cavalier and nonchalant actions of EOD technician SFC James displays none of the characteristics of teamwork and esprit de corps of which the US military is prided today. Also, the convoys consisting of one HMMWV rolling out of Victory Base Complex (Baghdad), or the rogue senior NCO sneaking off base, were far from realistic. The consensus from the vet community is that the CGI was good, but the portrayal in this film was embarrassing. This film, a remake of a Swedish film of the same name, follows a U.S. Marine captain, his wife and two daughters from pre-deployment preps to his assumed funeral, and ultimately to his return from being a POW in the hands of Afghan warlords. His post-traumatic stress becomes uncontrollable when he suspects his ex-con brother has been having an affair with his wife. This film is sure to stir up emotions through the sometimes-graphic displays of post-combat stress on the Marine officer and his family. The Lucky Ones follows three Army soldiers, who through coincidence and cancelled flights, end up renting a car together during their mid-tour leave from Iraq. Both the young male and female soldiers were wounded in battle and all had other battles to confront when they get home. This film reminds us that no matter our origins, education level, or years of service, veterans have a way of easily creating bonds and being faithful friends during the thick and thin. This film blends together a disaffected high schooler receiving advice from his mentor teacher, a US senator with aims for higher office and the probing veteran reporter that nags him, and two deployed soldiers in Afghanistan. I believe the iconic scene in the film is when the two soldiers are completely surrounded by Taliban fighters. It is winter, in the mountains, and one of the men has been wounded. Rather than try escaping on his own, leaving his comrade behind, the battle buddy stays with his wounded friend, a move tantamount to death for them both. This heroic action illustrates the true ethos of never leave a fallen soldier behind. Some may assume that a soldier’s job in combat is to follow and execute orders from above. But what happens when things just don’t add up? This feature film follows Chief Warrant Officer Roy Miller during the early months of post-invasion Iraq. Through personal curiosity and determination, Miller discovers that the faulty WMD intel was just a political ploy for invasion. 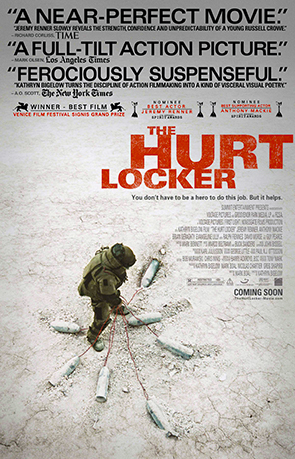 This film shows the lengths politicians may go to win the public relations battle and the how it effects the service member on the ground. Many Americans may not be aware that official policy prohibits women from joining MOS (military occupational specialties) that require direct ground combat. Soon after the conflict and insurgency began in Iraq, it became apparent that women would in fact be needed to help search female Iraqis and conduct other tasks that would be considered taboo for the men. Lioness is a documentary about the small group of female Army support soldiers who served alongside U.S. Marines in some of the bloodiest counterinsurgency battles in post- invasion Iraq. The film primarily focuses on their reflections and coping once they redeployed. In a directorial debut by Oren Moverman, The Messenger gives a completely new look at conflict as this film follows a captain and staff sergeant who have been assigned to the Army’s Casualty Notification service. Just recently returned from his own Iraq deployment, SSG Montgomery struggles to heal from his own battle wounds while transitioning to his new mission of notifying families of the fallen. This documentary follows a U.S. Army platoon in the dangerous Korengal Valley of Afghanistan during their yearlong deployment. Their remote fire base, Restrepo, was named after their fallen platoon medic. In ninety minutes, audiences will experience the death of a team member, firefights, and the sleep disorders that these young soldiers have to juggle while patrolling the mountains of a country where the enemy is not always clearly apparent. Writer and director Zachary Iscol fought in Al Anbar, Iraq in 2004 with the U.S. Marine Corps. Years later he returns to find a different situation, though the experience resurfaces many old memories. This honest film ends up revealing the nature of war from all sides. This documentary follows the final ninety days of a 15-month deployment in Iraq of Baker Company, First Battalion, Fifteenth Infantry Regiment. A part of the famed 3rd Infantry Division, the deployment, a part of the surge of 2007, was the third round in Iraq for many of the soldiers. Through four 60-minute episodes, we get an insight into what COIN looks like on the ground and the imprinted scars of battle that appear once back in garrison. In Warrior Champions, we learn the inspiring stories of four severely wounded Iraq veterans who have truly made lemonade from lemons. In as little as a year after losing limbs in battle, these athletes trained and competed for slots in the 2008 Paralympic Games. These four heroes quickly became the symbols of hope and determination for the myriad new patients that arrived at Walter Reed Army Medial Center. The Tillman Story tells the truth, which was concealed for many years, of the life and death of professional football player turned Army ranger Pat Tillman. Through dedication and an insatiable appetite for the answers, Dannie Tillman collected evidence and questioned top officials to get the real story leading to the fall of her son. Pat’s story is ultimately about patriotism and honor- the traits that were not present when top officials used his death as a public relations ploy.